Last week we brought you the news that the 2014 Dodge Dart lineup would rely far more heavily on the 2.4L Tigershark engine that was reserved for the performance oriented Dart GT (shown above) during the 2013 model year. For 2014, the Dart SXT, Limited and GT will all rely on the 2.4L and only the 2.4L for power as there are currently no optional engines for any of the Dart trimlines. This raised some eyebrows as this move would make the highest volume trimlines less efficient than the outgoing model year vehicles that were powered by either the base 2.0L Tigershark or the 1.4L MultiAir turbo motor but it seems that Chrysler has done some tuning to the largest of the Dart engine options to improve the fuel economy levels quite a bit – with the engine offering up to 36 miles per gallon for the 2014 model year. 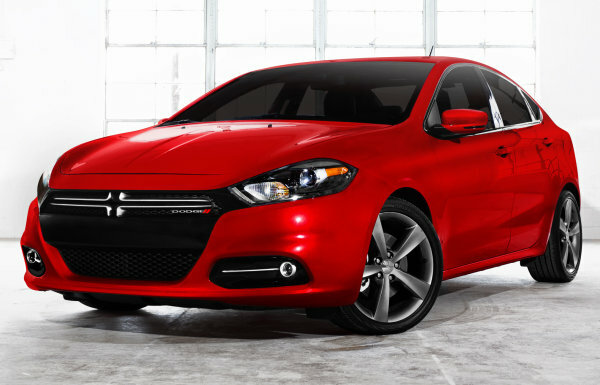 According to the folks at Allpar.com, the 2014 Dodge Dart SXT, Limited and GT fitted with the 2.4L Tigershark engine and a 6-speed manual transmission will return 36 miles per gallon on the highway while those same models with the automatic transmission option will hit 35mpg on the highway. For comparison, the 2013 Dodge Dart GT with the 2.4L engine and the manual transmission offered 33mpg on the highway while automatic GT models were expected to reach just 30mpg. Official EPA fuel economy figures have not been announced but should this information from Allpar be accurate, the 2014 Dodge Dart with the 2.4L engine and the manual transmission will be as efficient on the highway as the 2.0L base engine now found only in the Dart SE and when compared to the Dart SE with the automatic transmission – 35mpg would actually make the far more powerful 2.4L mill slightly more efficient than the 2.0L engine on the highway. Those who want to be able to hit 41 miles per gallon can still turn to the 2014 Dart Aero with a manual transmission while auto Aero owners can look to reach the EPA number of 40mpg. Provided that these figures for the 2014 Dodge Dart are accurate and there is no improvement to the base 2.0L engine, there is a good chance that the consumer market won’t have many complaints about the lack of engine options for the highest volume Dart trimlines. When presented with a more powerful engine that offers lesser fuel economy, it is almost certain that some buyers will complain about the fact that they cannot opt for one of the more efficient engines but with more power AND better fuel economy – making the 2.4L Tigershark engine the standard mill under the hood of most 2014 Dart sedans makes perfect sense. We are left wondering how the company could have reached these lofty numbers for the 2014 Dodge Dart with the 2.4L engine and it could be a case where the higher numeric gears (5th, 6th) have been adjusted to lower the RPMs on the highway but it seems unlikely that the company would do that for the 2.4L and not the 2.0L and if they did it for both engines, you would think that both engines would receive a similar boost in fuel economy. At the same time, Chrysler engineers could have made some subtle changes to the 2.4L engine to pull out 10% better fuel economy but they may have done so at the expense of power. Should that be the case, the Dart GT might still be the only model to offer the 184hp and 174lb-ft of torque while the non-GT models like the SXT and Limited would offer less power but better fuel economy. Once official numbers are revealed for the 2014 Dodge Dart, it will be interesting to see how the 2.4L engine sizes up to the 2.0L engine in terms of city and combined fuel economy. The 2013 Dart GT with the “old” 2.4L Tigershark was within a couple MPGs of the 2.0L models and highway fuel economy was actually the biggest of the gaps between the two engines so such a vast improvement in terms of 2.4L: highway mileage could help bring the combined numbers – and perhaps the city figures – closer to those of the less powerful base engine in the Dart SE. Should more information become available, you can be sure to find it here on TorqueNews.com.